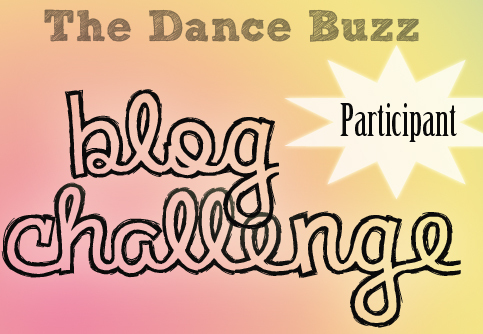 Attention all dance bloggers – I am excited to announce that starting in January, I am going to be posting monthly blogging challenges called “Dance Buzz Blog Challenge”. I hope you all find a few that sound like fun to participate in. I enjoy being part of a community of dance bloggers and I think it will be fun to get different perspectives or learn new things about the bloggers themselves. I also enjoyed participating in Pas de Trois when that was going on, and I miss the inspiration. Hopefully these challenges will jump-start your writer’s block, should you encounter that anytime soon. The next time you’re stumped at what to write about, you can check out all the challenges for inspiration. And you get to add this sweet badge to your blog if you’d like. BONUS! (To add the badge to your page, save the image to your computer and upload it to your blog). SO… HOW DO I PARTICIPATE? After I announce the challenge question or theme, write your own blog post related to that theme. Then add a comment on the original challenge post (on this blog) so everyone can share. DO I HAVE TO POST IN THE SAME MONTH AS THE CHALLENGE? No. Absolutely not. I am doing it by month because I think that is a reasonable time period for me to come up with another challenge. If you decide to do the January challenge in July, so be it – just please still add a comment to the challenge post so we can all share! Yes! Email me at thedancebuzz@gmail.com or leave a comment below. You’ll have to wait until January to find out… but I can tell you that it is a fun one! I'm in! This sounds like a great challenge and I love that you are creating an opportunity for our dance blogging community to connect and share. Post is up! Thanks Stefanie – can you provide a link? I wasn't able to access your tumblr page… would love to read the post!